Immunogen: Synthetic peptide corresponding to a portion of human RAIDD. Application Notes: Detects a band of ~24kDa by Western blot. Formulation: Liquid. In borate buffered saline, pH 8.2, containing 25mM sodium borate, 100mM boric acid, 75mM sodium chloride, and 5mM EDTA (disodium salt). Scientific Background: RAIDD (RIP-associated ICH-1/CED-3-homologous protein with DD) also known as CRADD (caspase and RIP adapter with DD) contains a DD (death domain) and a CARD (for caspase recruitment domain) which interact with RIP and caspase, respectively, to transduce death signals. RAIDD is constitutively expressed in many tissues and mediates apoptosis caused by Fas and TNF-R1. 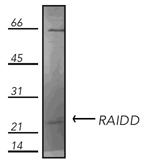 Immunohistochemistry analysis of paraffin-embedded sections stained with RAIDD pAb. 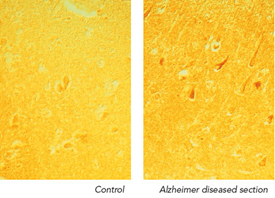 Peptide competition RAIDD is selectively increased in neurons in Alzheimer’s disease (right) in comparison to control (left).